← Walgreens, resist calls to deny people access to safer alternatives. OREGON: (CALL TO ACTION!) Three bills have been introduced that would enact 70% & 95% taxes on vapor products. PUBLIC HEARINGS on APRIL 10th & 11th. ATTEND THESE HEARINGS & TAKE ACTION NOW!! OR – Stop an Outrageous Tax on Vaping! 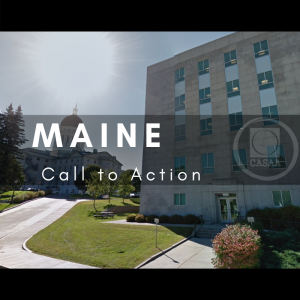 MAINE: (CALL TO ACTION!) LD 1028, which would impose an 81% wholesale tax on vapor products, is scheduled for a PUBLIC HEARING on THURS., APRIL 11th. ATTEND THIS HEARING & TAKE ACTION NOW! This entry was posted in All posts, Call to Action, e cigarettes, Maine, News, news-all, Oregon, Smokeless Tobacco, Vaping, Vaping News. Bookmark the permalink.